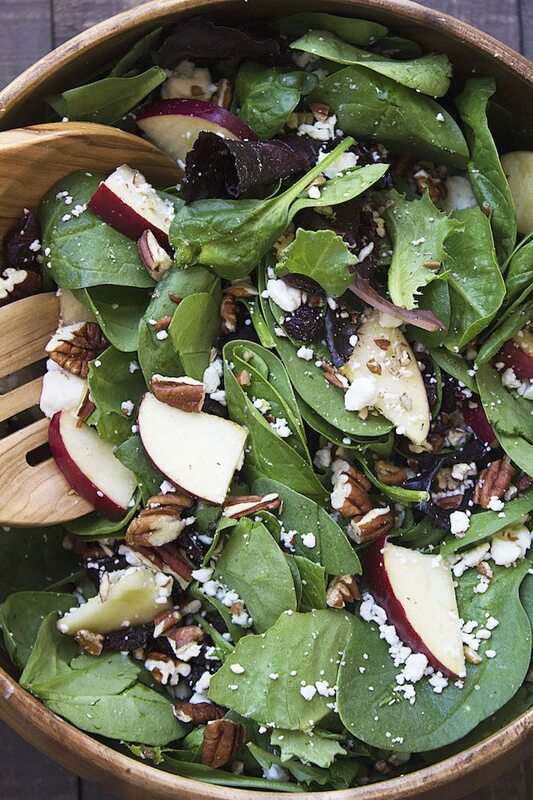 My husband and I have been on the hunt for a delicious salad and this Apple Cranberry Feta Pecan Salad hit the spot for us! 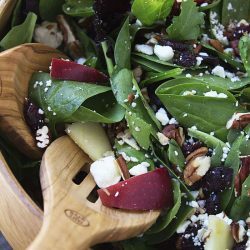 You get some protein in from the feta and pecans and the apples and cranberries add a yummy sweetness to offset the saltiness from the cheese. It is super easy to throw together, but doesn’t sacrifice in taste! 2. Salad-making is kind of expensive! It probably helped that my dad always had a huge garden and could go out and pick whatever he was feeling and throw it together, without having to worry about the fact that he only needed two cups of lettuce, but was forced to buy eight in a package. I still stand by the fact that I think salad-making is a talent though. 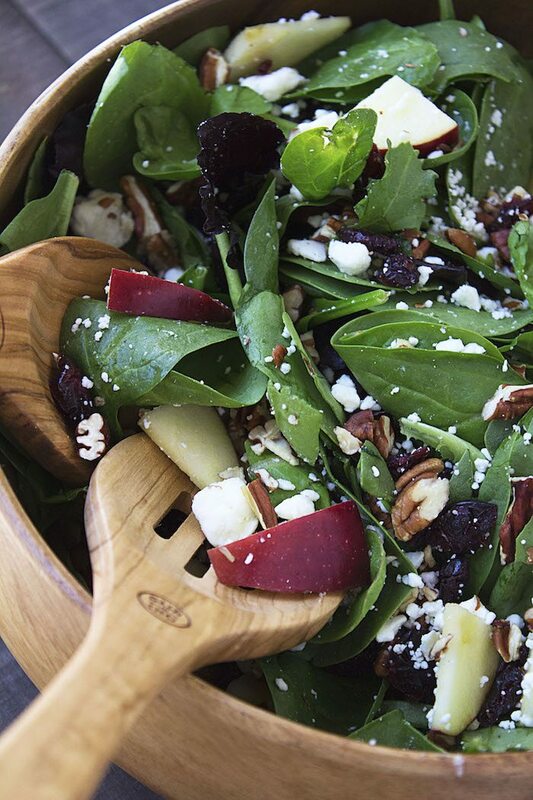 I’m pretty sure that everybody has eaten an Apple Cranberry Feta Pecan Salad in their life, or at least some variation of it. I have seen strawberries a lot of times instead of cranberries, but since Thanksgiving is coming up, I thought the cranberries would be a festive addition to the holiday table. We will definitely be having this salad at our Thanksgiving dinner and since we are going home for it, maybe I can even convince my dad to make it all for me. *See notes for favorite dressing pairing. Place salad in a large bowl. In a small bowl, toss the apples with the lemon juice. 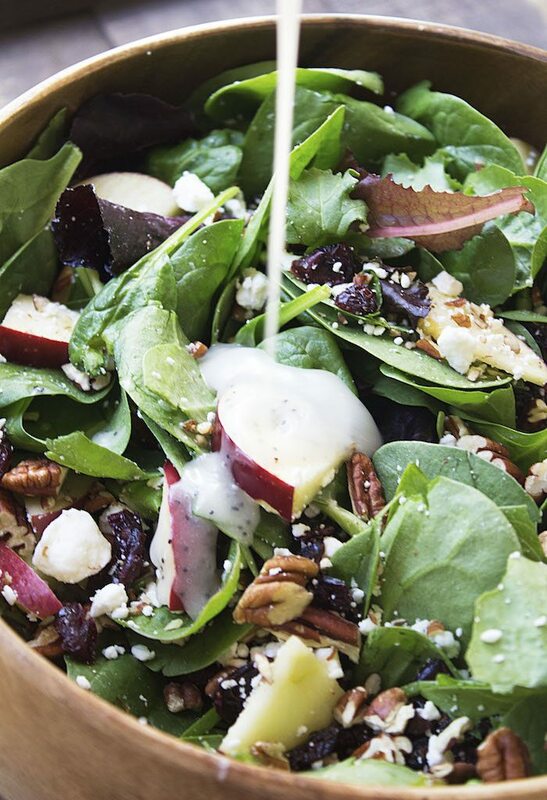 Sprinkle the apples, cranberries, feta, and pecans over the salad. Toss with your favorite salad dressing. Use my favorite Poppy Seed Dressing with this salad to make it even better!